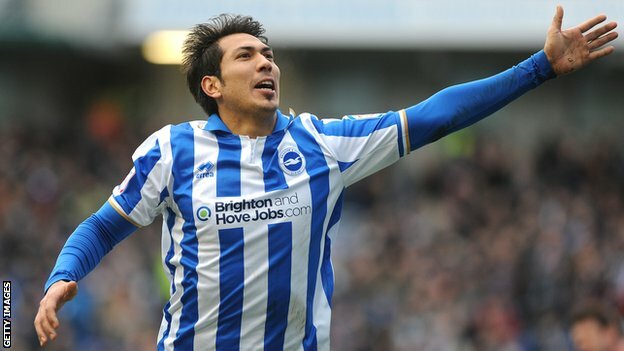 Argentinian forward Leonardo Ulloa became the first player to score a hat trick at the Amex with his three against Huddersfield to cement Brighton’s place in the playoffs. A cross from Andrea Orlandi set Ulloa up for a powerful header that Alex Smithies could do nothing about. Huddersfield equalised just before half time with an impressive acrobatic bicycle kick from James Vaughan but Ulloa restored Brighton’s lead with another header in the second half to spark three goals in five minutes. His third came from a one on one with Smithies where the Argentine kept his cool, rounded the keeper and knocked in for the hat-trick. David Lopez completed the scoring with a penalty after substitute Craig Mackail-Smith was brought down in the box by Paul Dixon. The Seagulls third straight win keeps them sixth while Huddersfield are only five points from the relegation zone and have conceded 24 goals in their last 10 games. Since Ulloas arrival from Spanish club UD Almeria in January he has scored 5 times in his 7 appearances and looks set to stay on top form and prove to be a valuable asset for Brighton’s promotion aspirations. Brighton will play Bristol City on the 5th March. March 3, 2013 in Brighton, Brighton & Hove Albion, Brighton and Hove Albion, Football, News, Sport.